Representing Citizens in the 2018 Boston Pride Parade was a true privilege. The colleagues who participated showed me the heart of our Business Resource Groups (BRG) and the bank’s strong commitment to diversity and inclusion. This was my first time participating in a Pride Parade. Going into the day, I was excited but also nervous about how people might react to me. Even with my glitter-covered face, Citizens’ colleagues encouraged my Pride enthusiasm – every single one was supportive and equally excited to be there. Anyone could tell this wasn’t just some “have to” volunteerism. The individuals and families who showed up put their hearts into this event. I was thrilled and inspired by the cheering parade attendees who were happy to see Citizens Bank – some even pulled out their debit cards and yelled “You’re my bank!” The looks of sheer happiness on these customers’ faces were so heartwarming because it showed that the inclusion we promote within the bank translates into how we treat each customer. 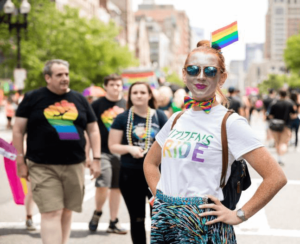 I am grateful to be a part of the Citizens Pride BRG and our involvement in the Boston Pride Parade reaffirmed for me the bank’s commitment to diversity and inclusion. This event inspired me to continue participating in BRG activities and sharing our mantra of inclusion and love throughout our communities.